California Kids Are Falling Behind in Education and More. What Is the State Doing to Help? In KQED’s new series, Starting Blocks, we’ll look more closely at why California has failed to gain traction on addressing the needs of kids and what it will take to change that. From his first minutes as governor, Gavin Newsom made it clear helping children was going to be a big part of his administration when his two-year-old son, Dutch, walked onto the stage during his inaugural address. Newsom scooped him up and kept talking. But in that same speech, Newsom made clear he realizes not all kids are as lucky as his own. He listed some of the issues California has to deal with to improve the lives of kids. “An achievement gap in our schools and a readiness gap that holds back millions of our kids. And too many of our children know the ache of chronic hunger," he said. About 20 percent of California children live in poverty — that number is higher for black and Latino kids. And, depending on their grade, nearly 60 percent of school children aren’t proficient in reading or math. 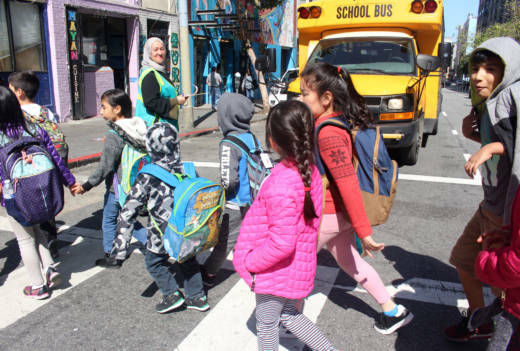 “Kids in California are not faring well and there's really no excuse for that," said Ted Lempert, president of Children Now, a California advocacy group. Lempert gives Newsom credit for focusing on early childhood in his budget. The governor has proposed investing in universal full-day kindergarten, universal preschool and improving access to state subsidized child care. Lempert said those issues are critical to making sure kids from poor families get equal opportunities. “Wealthy families are spending an enormous amount of money to make sure their kids have those services early on. Too many kids have absolutely nothing," he said. The legislature is trying to address the unequal playing field, too. At a recent hearing on early childhood education, Assembly Speaker Anthony Rendon said investing in young children is one of the most important things the state can do. Republicans are quick to point out that California's problems persist despite Democrats controlling the state for nearly a decade. "We have people that don't feel safe in their own communities. We've become 45th when it comes to education. We are the poverty capital of the country," said Jessica Patterson, chair of the California GOP. While specific rankings vary, California is consistently ranked high when it comes to poverty rates, especially when accounting for cost of living, and it falls toward the bottom of the list for education. Education is just one of the challenges children face, and for too long, there hasn’t been the political will to help them, Lempert said. "We have kids facing huge immigration challenges, kids facing racism, kids facing trauma," he said. "But the majority of the public is saying we need to make sure every kid has the support they need. And yet that's not getting translated into political action."